To name one of the most promising and well-paid professions of our time is quite easy. As well as to identify one of the best countries for IT geeks – of course, this is the USA. Since the number of large corporations and startups is booming, and the demand for top talented professionals is growing, the vacancies in IT are multiplying rapidly and respectively. So it is not a big deal to find a job in a computer technologies sector in the US. Today, by embracing the traditions, Redwerk would love to introduce California, as a harbor for those tech vessels that sail the high IT seas. Hollywood, LA, luxury and wealth, beach boys… Here you can find the largest, tallest and oldest trees in the world. In California, they know how to live high on the hog! 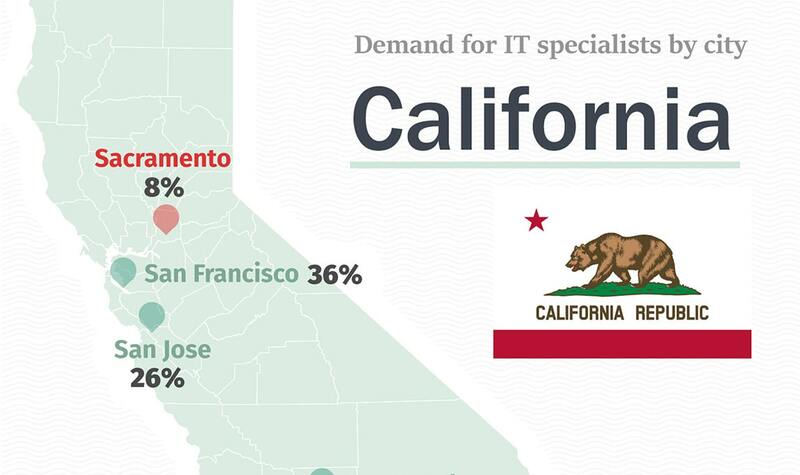 In the California Silicon Valley, where companies such as Facebook, Apple, Hewlett-Packard, Google and Intel are based, nearly a quarter of a million IT professionals work. This state is, definitely, replete with great tech minds, yet there is enough space for outsourcing. Wanna dip into the swirl of vibrant California life and enjoy it, wanna become the next Mark Zuckerberg, then catch a hint. Let’s not drag this out, we won’t deluge you with tons of words, just check the figures on the spot and make your dreams come true! You may also like: Offshore software development trends. Redwerk is an outsourcing company with years of experience in software development for various businesses in the US and Europe. We have a broad portfolio with international projects for media, eGovernment, and startup industries. Our expertise in IT core technologies like Java, PHP, Ruby, and Android, iOS, Windows platforms, allows us to provide high-quality solutions of different levels of complexity.